In a previous series of postings, I described a model that I developed to predict monthly electricity usage and expenditure for a condo association. I based my model on the average monthly temperature at a nearby NOAA weather station at Ronald Reagan Airport (DCA), because the results are reasonable and more importantly because I can actually obtain forecasts from NOAA up to a year out. The small complication is that the NOAA forecasts cover three-month periods rather than single month: JFM (Jan-Feb-Mar), FMA (Feb-Mar-Apr), MAM (Mar-Apr-May), etc. So, in this posting, we’ll briefly describe how to turn a series of these overlapping three-month forecasts into a series of monthly approximations. The first assumption we’ll make is that each three-month forecast is the average of three monthly forecasts. (My guess would be that NOAA is actually forecasting three-month periods.) If we had some random three-month average temperatures, we wouldn’t be able to figure out the numbers behind the averages, but in this case we have overlapping three-month forecasts, which corresponds to a three-month running average. Since most of the months’ values are thus reflected in three averages, we have enough information to pull the underlying values out in a principled manner. Which you can see will result in a five-value column vector where each value is the (rolling) average of three months. In order to reverse this process, we simply need to find the inverse of this matrix and multiply the running average vector. Of course, since the matrix is not square, we’ll have to use the pseudo-inverse. Yep, looks like we reversed the process. 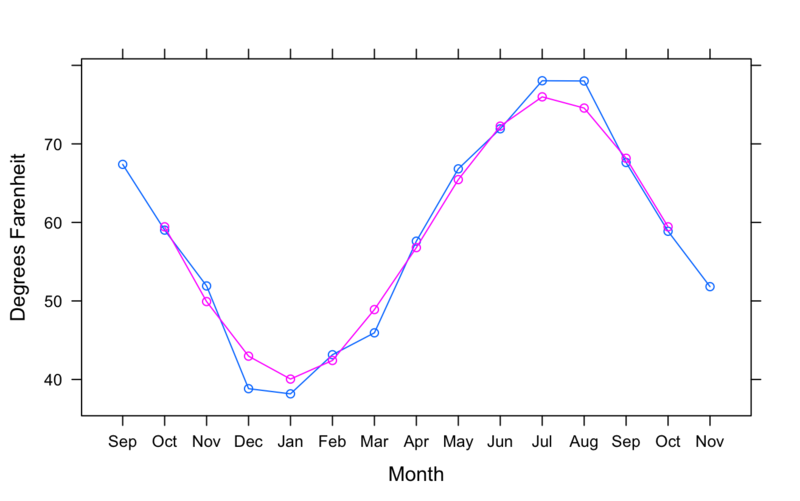 A graph of the NOAA three-month averages (in pink) and the results of this process (in blue) are shown at the top of the posting. They’re pretty similar, of course, though the highs go higher and the lows go lower which is exactly what we’d expect since an average will pull extremes towards the mean.